Available in sizes of 42 or 44 mm, the new Luminor Marina has a brand new silver-coloured dial, with a special brushed finish formed of vertical stripes, and large figures covered with white luminous material ensuring excellent visibility at night and underwater. Symmetrical with the date at 3 o’clock is the counter at 9 o’clock in which the blue small seconds hand rotates, blue being the colour of Panerai and the sea, the element with which the brand has always been historically linked. 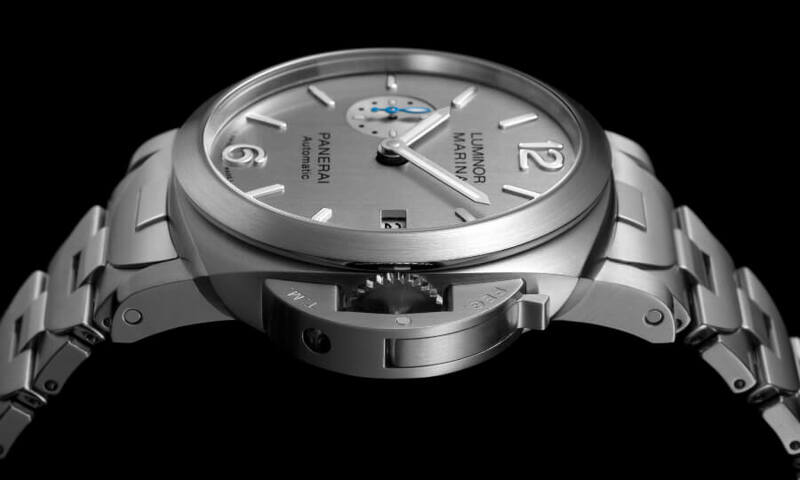 The case, made of AISI 316L stainless steel, an alloy particularly resistant to corrosion, has the classic Panerai design, unmistakable thanks to the “bridge” device which protects the winding crown, and it is fitted with a perfectly integrated metal bracelet. 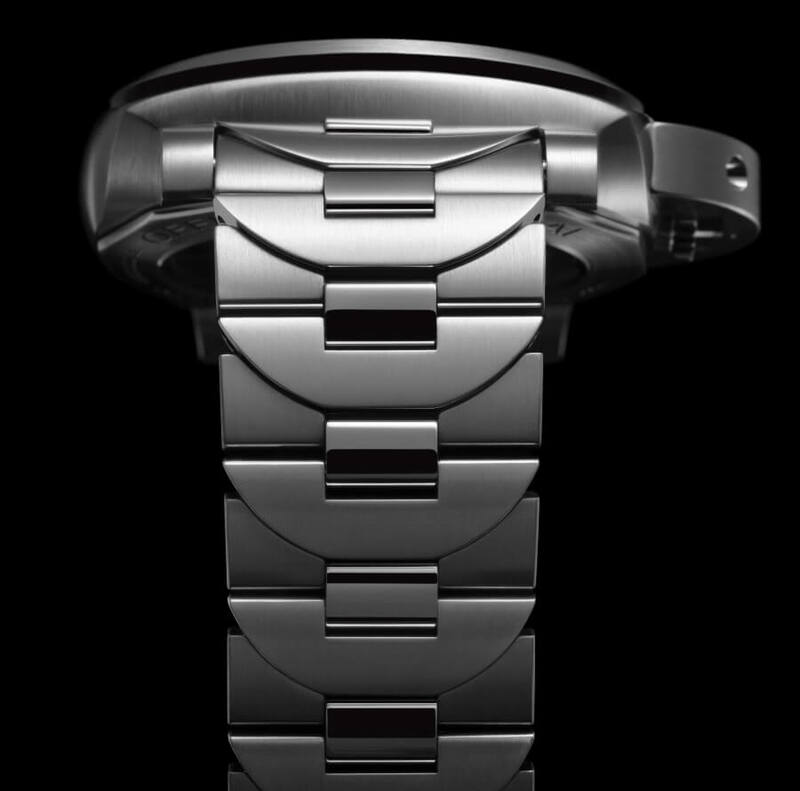 The shape of each link recalls the iconic bridge and it is harmoniously integrated with the other links – without any screws – in a bracelet which is perfectly ergonomic, flexible and pleasant on the wrist, sporty, yet sophisticated in design with alternating polished and brushed finishes. 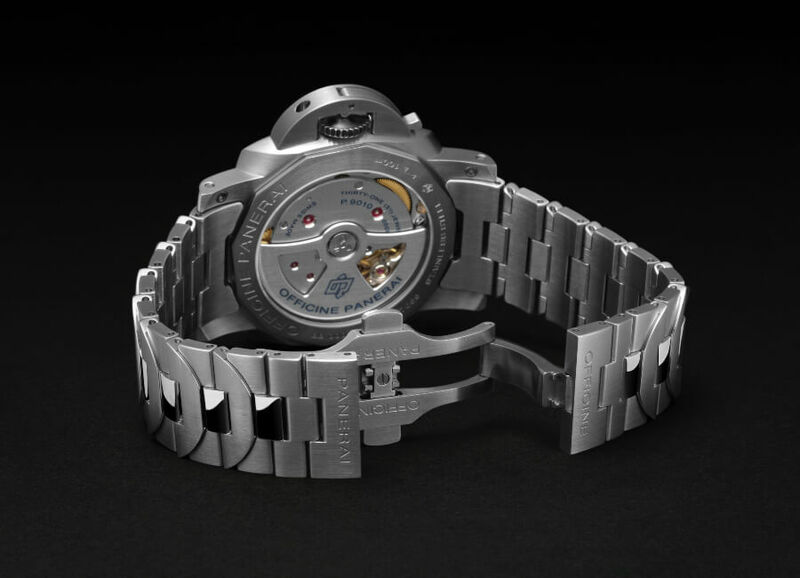 On the back of the case, the bidirectional oscillating weight of the P.9010 Manufacture movement, automatic with a power reserve of three days, can be admired through a sapphire glass porthole. The calibre has the device for stopping the balance wheel to synchronise the watch and the mechanism for rapidly adjusting the hour hand, which can be moved forwards or backwards without interfering with the running of the minute hand. This particular function, very useful when setting the time or changing the time zone, also enables the date to be adjusted very quickly. 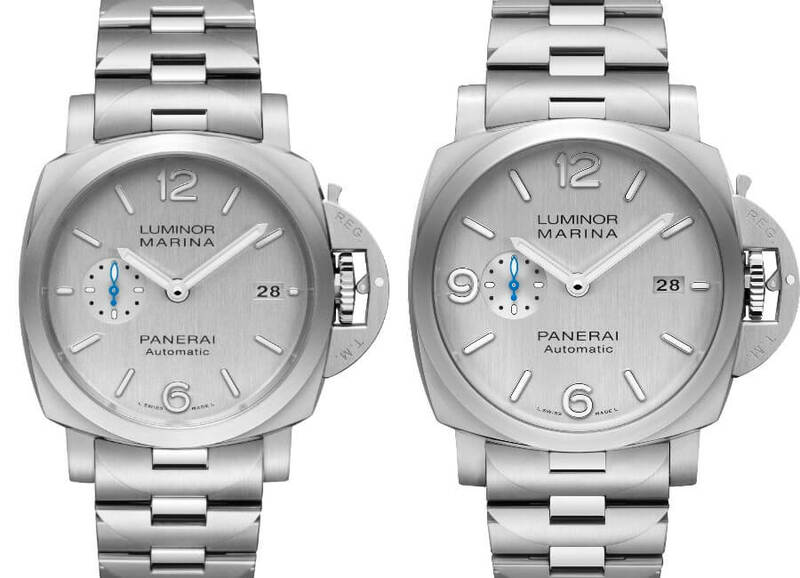 The two versions of the new Luminor Marina with a diameter of 42 mm (PAM00977) and 44 mm (PAM00978) are water-resistant to 10 bar (100 metres ) and 300 bar (300 metres) respectively. 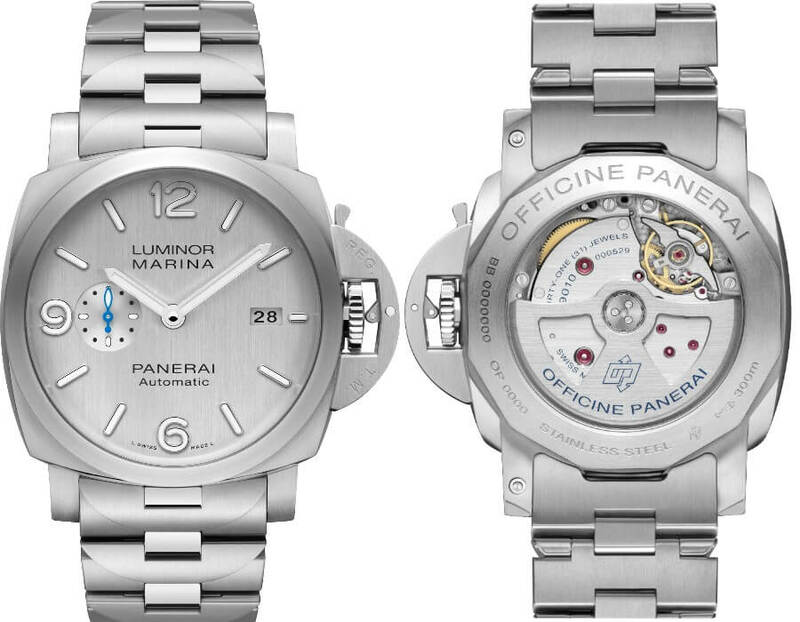 Movement: Automatic mechanical P.9010 calibre, entirely executed by Panerai. Case: 42 mm, AISI 316L brushed steel. 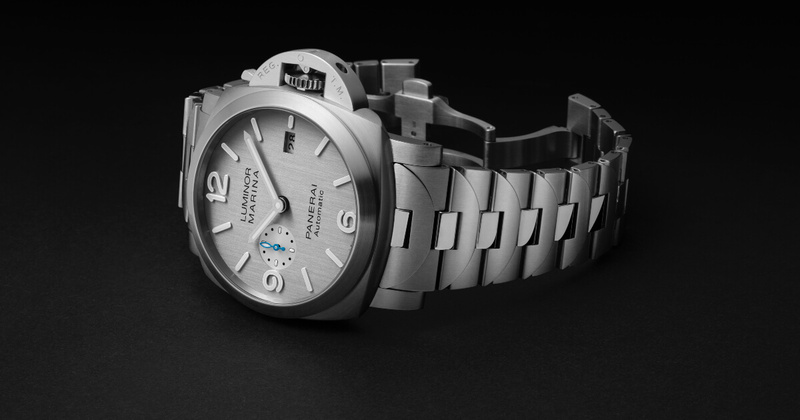 Dial: Silver vertical brushed dial with luminous Arabic numerals and indexes. Small seconds at 9 o’clock, date at 3 o’clock. Case: 44 mm, AISI 316L brushed steel. 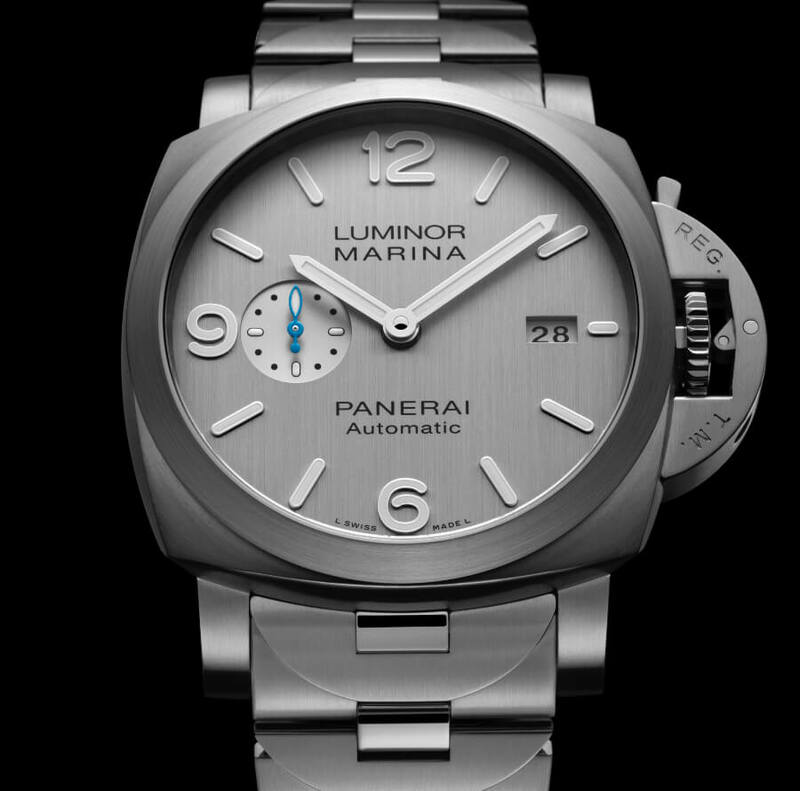 The price for the Panerai Luminor Marina 42 mm Ref. 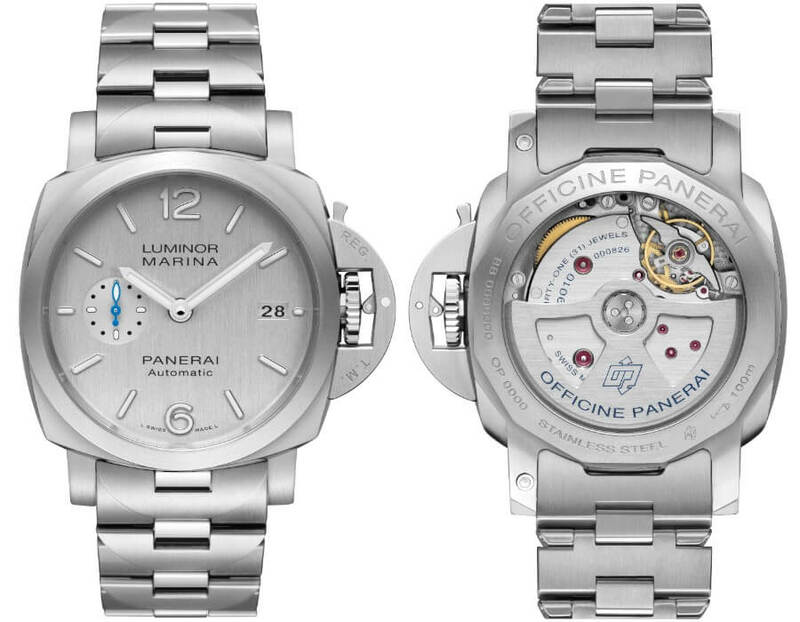 PAM00977 is $8,400 and the Luminor Marina 44 mm PAM00978 is $8,500.